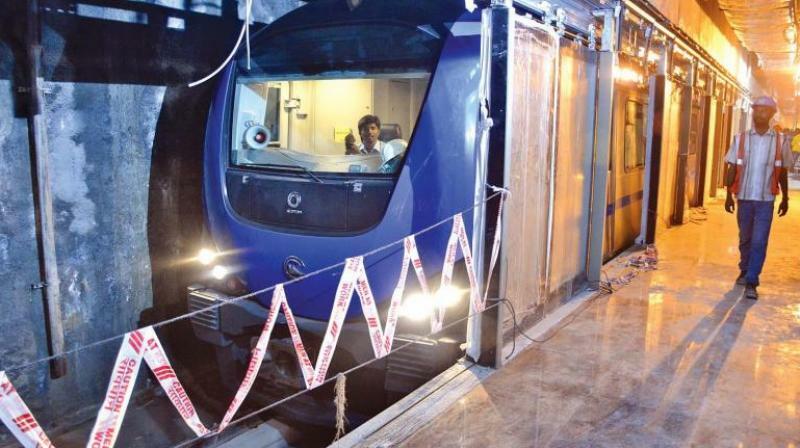 Chennai: The team headed by the commissioner of metro rail safety (CMRS) has started its inspection drive for the Chennai Metro Rail Limited (CMRL) from Monday morning onwards. In the first phase the team will begin inspection of the upline between Shenoy Nagar-Central Metro lines. The upline Shenoy Nagar-Central Metro line is approximately 5.62km stretch. Whereas, the downline which is 2.5km falls between Central Metro and Nehru Park will also be checked by the team. The inspection will be also cover the 4.5km stretch that falls between Little Mount and AG-DMS, once the inspection for Shenoy Nagar-Central Metro lines are done. K A Manohar, Railway safety commissioner, southern circle in a press briefing before the inspection had communicated that various parameters are inspected like the passenger safety as well as other amenities offered to commuters. The team will carry out checks of stations, firefighting systems, tunnels and calibration of the trains. Railway safety commissioner will authorise the operation of the new lines once the inspection is over and satisfactory. These inspections are mandatory procedure before the officials authorise operations of the metro lines. If the report of inspection meets all necessary parameters commuters will have a huge relief. They will then be able to board direct train from Central metro to Koyambedu and Airport through stations on the Poonamallee High Road. As per further update the Central and the upper track that connects Egmore Metro with Nehru Park will also be inspected alongside with the public space level. The lower track linking Washermenpet on one side and Anna Salai on the other is yet to be completed.